Is it cheaper to leave your heating on all the time or turn it on and off? The answer is – it depends! By leaving your heating on, the boiler will have to work to keep the temperature at a set level, whereas having it come on and off at set times will only heat your home at a given period; however your boiler will need to work harder to heat the house from cold to the required temperature. The answer is purely dependent on how well insulated your home is. If you’re home is very well insulated, you are better off leaving the heating on at a set temperature, where the thermostat will work with the boiler to maintain the temperature relatively easily, since there is little heat loss occurring. Conversely, if your home is not energy efficient, potentially a Victorian property for example, then you are better off just heating it up for the times when you need it. The majority of people are out during the day, so most people opting for this heating schedule will fire the boiler to come up early in the morning for a couple of hours so the house is nice and comfortable when they wake up, then set it to come on in the late afternoon until they go to bed. It will be more cost effective to heat the home as and when you need it, as any heat you generate will be lost fairly quickly through the walls, so if you try and maintain that warmer temperature all the time, your boiler is going to have work incredibly hard. This does mean that you are not going to have the home ‘warm’ all the time, but if you work during the day, it should make things a lot cheaper compared to leaving the boiler on. Don’t take our word for it – test it for yourself! So granted I have cast everyone into two baskets – energy efficient and not energy efficient. The truth of the matter is that you will most likely be somewhere between the two, so which heating method will work for you? Well there is a simple test you can run at home to see whether you should have the heating on all the time or you should use the programmer so it only fires up a couple of times a day. Basically over the course of two weeks – test each method. You will need to take gas readings to do the test, and also bear in mind that if a sudden cold spell hits then your results will most likely be null and void! We seem to touch on this a lot, but it really is a fundamental truth. If you live in a well-insulated house you will spend less on your energy bills. In terms of cost effectiveness, loft insulation is the cheapest and easiest to do, costing about £250 if you opt for mineral wool insulation. This will pay back in just a couple of years. Cavity wall insulation and floor insulation are the next things to target. If you live in an older solid wall property, cavity wall insulation won’t be possible and you will need to insulate either internally or externally. Getting a more efficient boiler can also help lower your bills, along with better heating controls. For example, if you don’t have a thermostat, you will likely be overheating your home when the programmer kicks in. Thermostatic valves on your radiators can also regulate the temperature in rooms and they allow you to stop heating rooms you aren’t currently using. Thanks for posting about the Energy Efficient Boilers that help to maintain the thermal effect. Its really helpful. Reading the comment to the question of leaving your heating on all the time or not, and the answer “it depends”, and then giving examples I find infuriatingly annoying in maintaining the urban myth of the statement that it is better to leave your heating on all the time. A building in the heating season losses heat at a rate that depends on the difference between inside and outside temperature. Remember your first day in science? Heat goes to cold? If you heat a house to above the outside temperature you lose heat. It is called heat loss for a reason. That is energy. You have to replace it if you want to maintain the temperature. Next, when does your boiler operate most efficiently? When it has the coldest return temperature i.e. the house is starting from cold. This is because the boiler then gives back the latent heat component of the flue gas heat and hence you see plumes of condensation coming out your flue. (post 2005 boiler) You get roughly 10% of your gas energy back by condensing all the latent heat. So. If you are not in the house don’t heat it. If you have an old house, put the thermostat on a reduced temperature to protect the fabric against condensation while you are away especially if unoccupied for a long time. Never just heat your house because some badly, mis or ill informed/educated comment comes about in a blog, from what your granny or Joe the gas engineer said. Would you keep a kettle boiling all day because you think it will be cheaper than heating it up everytime you want a cuppa? Would you leave your car running overnight so it was nice and toasty for the drive to work in the morning because it is better to keep it hot than warm it up each day? You know you are wrong to all those who continue the myth and to those realising this misguided direction do not follow, stop them with the above simple and accurate statement. I just read there were a lot more comments on this as I was about to post. There are obviously still too many people that think they are educated in this state but have no idea of fundamentals. No wonder there’s so much scientific misunderstanding around if even highly educated engineers and scientists can get this wrong (and I know of a few). The idea that using heat now can save on heat later literally goes against the first law of thermodynamics. The simplest way to explain this is by using a leaky bucket as a metaphor for your house. You can keep it topped up full; you can keep it topped up to a lower level (reducing the rate of loss); or you can let it empty completely (stopping the loss entirely). If you allow it to empty completely before filling it back up when needed, this simply cannot use more water than keeping it topped up to a low level the entire time. The amount of insulation is exactly the same as the size of the leak. A smaller leak will lose less water over time but the principle remains the same as a larger leak. If anyone still thinks that leaving the heating on, or topping the bucket up, will use less energy/water then I’m all ears – but I’ve never seen an explanation of how this would work, other than the non-sequitur that it has cooled down so much that it somehow needs more energy to heat back up again. Been there, done it. We had LPG when first married. Our bungalow was over insulated (if there can be such a thing) – we built the property ourselves and put rock wool under the voided floor, hanging the insulation in netting between the floor joists, but still keeping a void, super insulated the loft and used insulated blocks for the inner walls. For a week we put the heating on constant, but at a low temperature and boosted it for an hour when we came home. The following week, in very similar weather conditions, we put the heating on timed – 2 hours am and pm. We took meter readings at the beginning and end of each week and found that leaving it on a low setting constantly was more economical. Truly unbelievable greenage! It is irresponsible to publish your view here without referencing scientific research paper to back up that leaving your heating on all the time is cheaper than on/off as required, I’ll go with the scientifically accepted understanding everytime otherwise as should your readers.. I have a swimming pool and cringe everytime a pool man claims it’s cheaper to heat then maintain a hotter operating temp than just heat when needed. An outside pool is relatively poorly insulated, even with a cover on.. 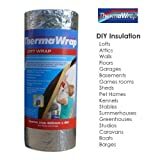 The level of insulation makes no difference to what is the cheapest method.. Think about it. Hi Physics Teacher, I am going to have to disagree. The level of insulation makes a huge difference, especially if the insulation is on the outside of the property (external wall insulation) since the bricks in the property warm up and act as a thermal store. It is clearly also true, if heat loss occurs at a lower rate through the properties envelope (ie. walls, roof and floor) then the amount of heat required to replace the lost heat will be lower. TLDR: If your insulation is good enough the difference in cost between continuous operation and on-demand operation should be negligible and may well be more convenient but can never be cheaper. The level of insulation can make a big difference to the “difference” in energy usage between running a system 24hours a day vs just when needed and it can certainly reduce the energy usage per hour of maintaining a particular temperature. It does not, however, change the fact that a building at a temperature above ambient will always be losing some energy to its surroundings and therefore some energy must be introduced to maintain that above ambient temperature. When a building’s internal temperature is the same as it’s external temperature no energy is being wasted and therefore every hour that the building sits cold (and heat is not required) it is performing at 100% efficiency. When the building’s internal temperature is higher than it’s external temperature some energy will be being lost and the level of insulation only affects the rate at which that energy is lost. The point here is that a building’s efficiency only drops when there is some higher than ambient internal temperature, the rest of the time it’s performing at the maximum possible efficiency. The more insulation a building has the less time the building spends with its internal temperature being the same as its external temperature. Therefore the difference in cost between running the heating system continuously or as needed decreases as insulation increases. A building which is very well insulated and cools back towards ambient temperature so slowly that it doesn’t reach the ambient temperature in the time when heat is not required therefore is continuously losing energy at a constant albeit low rate. Therefore the heating system will be no more or less efficient if it is set to be on continuously or only as needed because the building never cools to ambient and so it always has some energy to lose every hour. It would not be possible for continuous operation to become cheaper than only heating when required because that would imply that you are actually creating energy, and as we know it is not possible to create energy. It may certainly be more convenient to always have the heating turned on and I’ll acknowledge that with some really good insulation the financial cost of running your heating continuously may be very low especially if you have solar panels or some other “free to run” energy gathering systems but it still wouldn’t be cheaper (though it also wouldn’t be any more expensive) than running your heating on demand. 5. Numbers may be somewhat unrealistic in order to make the mathematics easier. 6. The temperature drop (energy loss) is linear over time. 7. The heating system increases the temperature by 1C for each kWh used. 8. The occupants get up at 7 am and leave the building at 8 am. 9. The occupants return to the building at 6 pm and go to bed at 10 pm. 10. The occupants only require the building to be at a comfortable temperature when they are awake and in the building. 13. Energy (kWh) can come from multiple sources e.g. gas boiler, solar panel, sun trap, etc and some of these energy sources are cheaper than others. At the beginning of each hour, the system will use 5kWh to bring the temperature from 15C to 20C and over the course of the hour, the building will drop back to 15C. On average each hour the system will use 5kWh to maintain a comfortable temperature. Every 5 hours the system will use 5kWh to bring the temperature from 15C to 20C and over the course of 5 hours the temperature will drop back down to 15C. On average each hour the system will use 1kWh to maintain a comfortable temperature. Every 10 hours the system will use 5kWh to bring the temperature from 15C to 20C and over the course of 10 hours the temperature will drop back down to 15C. On average each hour the system will use 0.5kWh to maintain a comfortable temperature. Now I’ll agree that these examples are somewhat simplistic but the principle still holds. Hi Carole, when you are on Economy 7, there are normally 2 immersion elements – one linked to the cheaper night time electricity and one linked to the day time (more expensive) electricity. The cheaper to run immersion could be on all night as the thermostat on the hot water tank will stop it producing hot water when the required temperature is met, however we would normally suggest running the ‘cheaper’ immersion a couple of hours per night and only running the day time immersion when there is an absolute emergency for hot water as this will cost you about 3 times as much to produce hot water at this time. I agree completely with daveM. I.e. You save by switching off. This is just A level physics (and I have a Cambridge PhD in the subject). Test question: do you think that if you were going away for a month you would save by keeping the heating running? I beg to differ regarding keeping the heating on or switching it off. The sure way to reduce fuel consumption is to reduce the temperature indoors since heat loss is proportional to difference of temperature between indoors and outside. The easy way is to have the heating off at times when that has no effect on comfort e.g. When no one is at home or when everyone is tucked up under their duvets..The classic question is: would you save by leaving the heating on if you were going away for a week or more? Hi how much would it cost for me to keep a 13fin oil radiator on all day every day it’s 3000w. The amount of electricity used by your heater, assuming no thermostatic control, would be 3000w x 24 hours / 1000 = 72kWh. You will see the cost per kWH, otherwise known as a “Unit”, on your latest electricity bill. You kindly recommended Mr Stephen Edwards to me for a boiler service. He is truly remarkable – while working he identified a fault with my three year old Worcester-Bosch Greenstar boiler. This was a potential safety concern; he gave me appropriate advice. He also provided a carbon monoxide alarm. Altogether, in every way, I was greatly impressed. He is a phenomenally hard worker, honest and presentable and works methodically and knowledgeably. He put up with difficult working conditions and parking restrictions without complaint. You were right to recommend him and I’m very glad you did. Finally, a heating engineer whom I feel able to trust. Is it safe to switch a boiler off and on from standby every day? CAN’T YOU RUN A CONTROLLED EXPERIMENT LIKE THAT YOU SUGGEST AND PUBLISH THE RESULT TO EMPIRICALLY ESTABLISH THE TRUTH (FOR A GIVEN PROPERTY)? pERHAPS DO TWO EXPERIMENTS – ONE IN A NEW BUILD AND ONE IN A VICTORIAN PROPERTY. Superb web site because it was simple to read and answered ALL the questions I had regarding radiators and heating the home. Excellent. Thank you. Vilnis, what you say is untrue. We have a passivhaus and for us it is much cheaper to keep the boiler on but use the Heating controls to control it. Agreed Seb, the level of insulation and how good the heating controls both have a huge impact on whether it is cheaper just to leave your heating on all the time. It is NEVER cheaper to let your heating run continuously. Hi Kim, if it ran 24/7 it would cost approximately 36 pence per hour (3kw x 12 pence per kWh). To be honest though, they normally have thermostats built in which ensures the heating is not left on all the time, this means you would actually use slightly less. The best thing to do to get an accurate measure of how much electricity that device uses is either use an energy monitor or wait until you have a smart meter installed on your property. Once you get this, you can then see the cost of keeping the unit on over that time. The key to getting an accurate reading though is to ensure that you don’t switch on and off other appliances as you are carrying out the test, as this will obviously impact the amount of energy used too! Depends on your heating and insulation. With underfloor heating it is better to leave it on AS IT TAKES ALOT OF ENERGY TO HEAT IT UP AGAIN. The one issue not dealt with by most of the posts in this thread is the efficiency of the heating means. You will always have to put more energy out of the radiators or underfloor pipes by running 24/7 but your system might not run as efficiently when working across a big gap between flow and return temperatures if for example using a heat pump with an underfloor system which could mean that you have to put more energy in to get the required amount out when operating across a large temperature range. This is why purpose built heat pump systems work at lower flow temperatures and use larger bore pipes and radiators and why hybrid systems can make sense when retrofitting to a previously installed set of pipes and radiators. Another issue with underfloor/heatpump heating is the time taken to heat up from cold which can mean that it takes longer to get to temperature tempting people to turn on additional heating such as the 3kW oil filled radiator mentioned elsewhere in the thread and this could get very expensive. Generally I agree with the posts suggesting that it is almost certain that timed on off is better than 24/7 running but, like with most things, there may be a few exceptions to prove the rule! For me it was defintely cheaper to turn my heating on and off, basically because if the house is cold in the morning it forces me out of bed! It bugs the wife and kids, but it then means that our heating comes on at 4 pm, and it tends to warm up pretty quick and it goes off about 10pm. I can’t beleive it would be anymore energy-efficient to keep the heating on all the time? Hi Orto, it is normally only worth doing when the house is incredibly well insulated (i.e. a new build). The reason here is the rate of heat loss is extremely slow, so the boiler will only turn on to ‘top up’ the heat in the house. When you consider older properties, they get cold very quickly when the heating is switched off, so for these properties it is normally worth trying to minimise cold draughts entering the house (by draught proofing) but actually the heating should only come on as and when it is required to help lower energy usage. We had a guy come fix our radiators because it took almost an hour to heat and he had to bleed it out because there was air in it. He suggested we leave our radiators on at a certain temperature and it will be cheaper so we did that of course. A month goes by and we get our gas bill, it came out to be $256!!!! Its not cheap at all to leave it on at all times and we had it set to 62 degrees!!! Do not leave your radiators on!!! This answer is misleading because it is always better to have the heating on only when you need it (when you are in the property), irrespective of the level of insulation. The short answer is to keep the temperature as low as you can bear (without being uncomfortable) and turn it off when you don’t need it, for example if you are out, or in bed. The correct technical explanation is simple physics (thermodynamics) and that is that the heat lost is proportional to the temperature difference between the external and internal temperatures – the bigger the difference, the more heat is lost. A well insulated property will lose less heat than a poorly insulated one, so for any given internal and external temperatures, the energy consumed (and therefore the costs) will be lower. Leaving the heating on when it’s not needed maintains a higher temperature difference (because the internal temperature does not fall), so more energy is wasted, even though the heating may have to work harder when it’s switched back on. Good to see someone here actually understands the science of this, rather than passing off opinion as fact. Of course that is correct – people should only turn their heating on when it is required, however most people aren’t doing this – we come across a huge number of people who use their thermostat to manage their heating. This is what most people do, it means they don’t need to be ‘on it’ since their thermostat won’t overheat their homes. The issue is that if you live in an older property which lacks insulation then you will burn through fuel – so turning it on and off with a programmer is better. Conversely if you live in a really well insulated house, then leaving your heating on all the time (but using the thermostat to manage the temperature) is the best way to go. That is nonsense James. You can’t have one principle for one type of house and another for a different type! You are clearly NOT a scientist nor an engineer. Sure, the energy loss/use (it’s the same thing) will be less in a better insulated house, But it will still use/lose more energy the hotter it is, because the hotter it is the faster it loses it (temperature gradient between inside and outside). The energy used to re-heat the house is a red herring. It’s the overall loss/use that dictates what the cost will be. When I lived in an old house with an oil system, I saved nearly a 1000$ one year leaving it on at 19 C all the time. Then, the next year, I had this idiot downstairs neighbor opening her windows at -30C, the floor would turn icy… I moved cause of that imbecile. I found out raising or heating after lowering for a while cost a bundle. Never again and will I rent something heated by oil or gas. I love the Internet. I have always argued with my wife over this one and it turns out I am right! Really useful article and one that I shall definitely be showing the wife! I have always wondered about this, I have an old victorian property that has very little insulation, in fact I am looking to install triple glazing. But now I know – turn it off when I am not there! Thanks for this, really useful.